The best iron sights are undeniably among the most reliable solutions to aim your rifle. It is one of the accessories you have to invest in if you want to acquire and aim your target with ease. If you’re still on the stage of narrowing down your options so you can find the most appropriate iron sight for your AR15 then rest assured that this article can be of help. 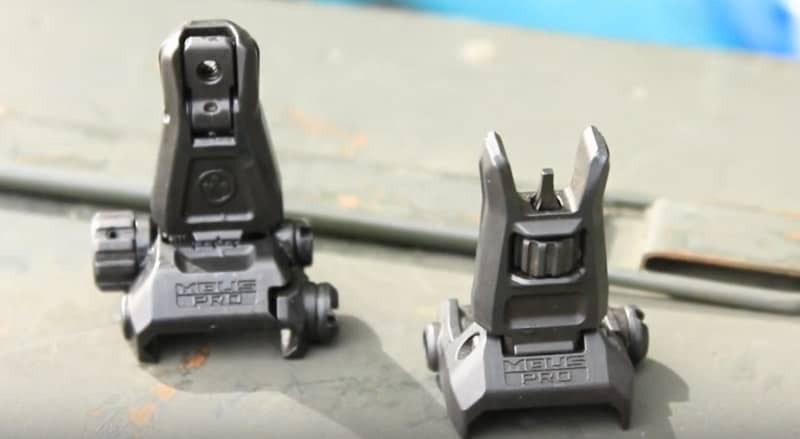 Here are reviews of the top iron sights designed for the AR15 together with their individual advantages and disadvantages. A short buying guide will also follow to guide you in your decision. How to Find the Best Iron Sights? How to Aim with Iron Sights? 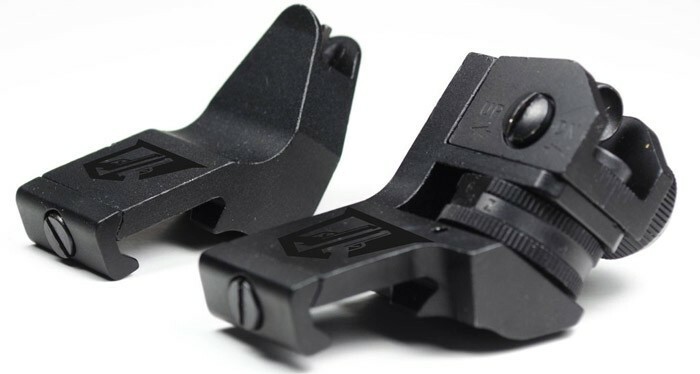 It’s even more advisable to invest in the best flip-up sights designed for AR15 because aside from boosting your shooting accuracy, they also serve as backup optics. They can also save you in case of an emergency. It maximizes efficiency by ensuring that your view will not be blocked when picking it up. 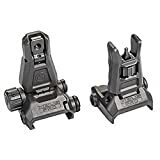 In addition, these iron sights are durable and sturdy enough that they handle even the harshest environments and conditions. Note that each shooter has to learn and master everything related to shooting with iron sites. This knowledge is a big help in their discipline, breath control, and shooting accuracy. If what you are looking for from an AR15 iron sight is durability then the Magpul MBUS Pro Steel Iron Sight will never disappoint you. Made to be tough, strong, and high in quality, it serves as the perfect backup for your AR15. The toughness of this steel sight set is unquestionable considering the fact that it is constructed out of genuine steel material. It also boasts of its Melonite finish, which aids in keeping the metal rust-free, shiny, and smooth for the long term. One great advantage of this unit is that it lets you easily make adjustments to the front post’s elevation without the need for any tools. Adjusting the rear elevation is also easy. This iron sight for AR15 has its share of flaws, though. One of which is that it does not lock or spring as a means of holding and securing it in the up position. It’s also a bit pricey plus it doesn’t let you adjust the front sight elevation. Still, it’s safe to say that it’s a great option not only for its durability but also because it is well-built and lightweight. You will also surely love the tightness of its hold on the gun as this minimizes the risk of wobbling or letting it stay at an awkward angle. It is also slim and narrow, not bulky. 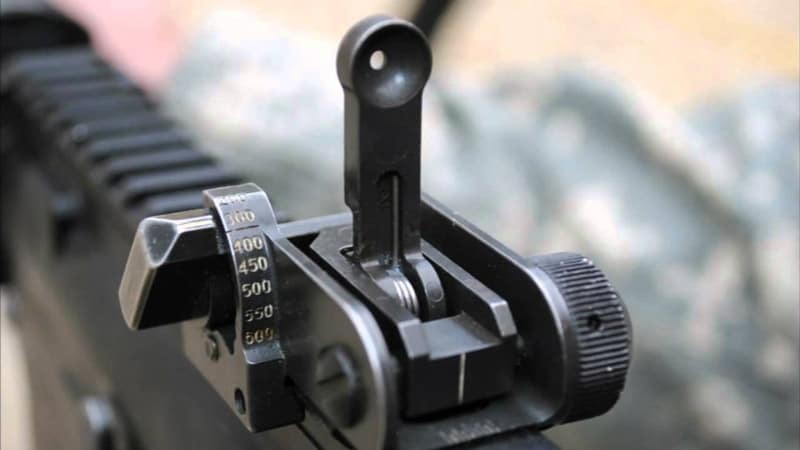 The narrowness of this iron sight makes it appropriate for use on a setup featuring a laser optic. 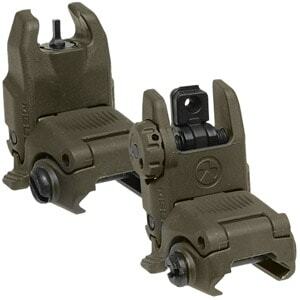 Magpul MBUS GEN 2 Rear and Front Sight Set is also one of the best AR15 iron sights if you’re interested to buy a highly sturdy and tough iron sight, which is not too heavy that it’s already difficult to manage. You’ll never experience problems with the weight of this rear and front sight set because it’s constructed in such a way that it’s lightweight. It makes use of an impact-resistant polymer for its construction, improving its ability to resist tough operational abuse while still retaining its manageable weight. You’ll also like the fact that you can easily activate its spring-loaded flip-up sight from both sides. One drawback that you might encounter, though, is that the post designed for the front sight is quite big for the provided peephole so you might have problems in sighting accurately. Also, overexposure to heat might cause the sight mount to warp eventually. Even with the issues, it’s still worthwhile to buy because its polymer construction is not only well-made but also durable and lightweight. There is also a guarantee that it can maintain an erect sight with the aid of its detent and spring pressure while also letting you enjoy an unobstructed folding upon impact. Many also love the fact that it is easy to install. The sight mount is prone to warping. Another great choice is the MaTech Mil-Spec Iron Sight. It actually works as a low-profile flip-up rear iron sight with an adjustable function for both the elevation and windage. One favorable feature of this product is its ranging aperture, which is helpful in giving you your desired precise accuracy. You can adjust its elevation up to 600 meters. In addition, it also boasts of its solid build, which makes it perfect to use regardless of your current mission requirements. Another satisfying feature of this unit is its one-touch, flip-up aperture, which is actually a big help if you want to utilize it instantly. However, note that there are cons to this unit – one of which is the fact that some users complain that it’s a bit difficult to install. Also, breaking in its built-in windage knob is a bit tough. Still, no one can deny the fact that this back-up iron sight performs its function pretty well. It is even compatible with all AR rifles. Furthermore, it makes use of solid metal for its overall construction, allowing it to withstand a lot of abuse. You’ll also find it convenient to use considering the fact that it has a foldable function. Such makes it possible for you to stow it in case you won’t be using it. It also seems to work well regardless of the optics you’re using because of its perfect cant and narrowness. 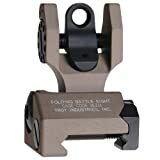 If you are looking for an AR15 iron sight which is not too complicated to use and install then checking out the Troy Industries Folding Battle Sight Rear is a wise move. Many consider it as a great choice for those searching for a back-up iron sight designed for the AR platform. You can install it in any rifle, which has red dot sights. It also boasts of its superb engineering as well as the fact that it is user-friendly enough that you can easily install and adjust it. It is also capable of holding its zero with a superior consistency. However, remember that unlike other iron sights already discussed in this article, this one does not come with an adjustment for the elevation. The price for this product is a bit high, too. In addition, it seems to be unable to spring into its place. Overall, you can’t go wrong if you choose this product from Troy even if it has some flaws. Aside from being easy to use, there is also a guarantee that you can securely lock it into the vertical position using its crossbar made of solid stainless steel material. Folding it is also easy with just one push of a button. Furthermore, it’s designed to showcase its rugged reliability, which is the main reason why it’s a favorite among shooters in different parts of the world. 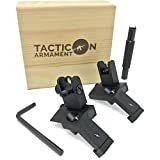 In case you are after sturdiness and flexibility then the 45-degree Offset Flip-up Iron Sight from TACTICON is definitely a great buy. You will instantly notice the sturdiness of this unit once you see that it’s actually constructed from genuine metal. What’s good about this iron sight is that it provides 45-degree offset sights, making it possible for you to rotate the weapon a bit. Such is the key to witnessing your target and getting engaged. It also flips up with just one press of its push button. 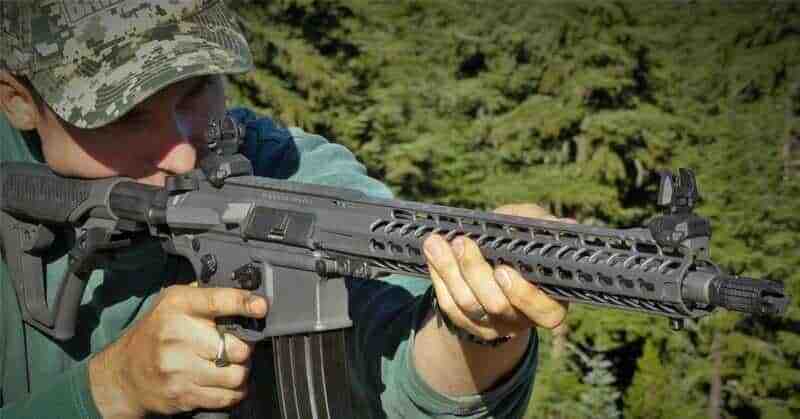 It’s a flexible option, too as it fits all tactical and hunting rifles, like the Colt, Remington, and Winchester, as well as the AR-15, M4, and AR-10. One possible issue that you might encounter with this unit is the stiffness of its deployment during the first few uses. However, some users say that this only happens initially. The deployment tends to ease up after multiple uses. Other than that issue, most users agree that it’s a high-quality iron sight worthwhile to invest in. It works perfectly and is well-built. Another benefit of this unit is that it promotes a high level of durability and accuracy whether you are planning to use it as the primary or the back-up sight. You’ll surely be pleased with the fully adjustable front sight post of this iron sight, as it allows you to adjust the elevation. It even comes equipped with the adjustment tool. Furthermore, it lets you fully adjust the windage. If you are looking for an affordable iron sight then the Ozark Armament 45-degree Offset Backup Iron Sight definitely fits the bill. It’s definitely a good choice because it lets you enjoy a quick and repeatable transition in case of optic failure. It lets you obtain a standard and clear A2 sight view just by simply canting your weapon. What is even more remarkable about this backup iron sight is that it does not cause any interference with the optic sight picture. You’ll also feel glad to know that this budget-friendly choice is easy to mount and zero while also being well-built. One possible issue that you might encounter with this iron sight is on its paint that seems to rub off pretty easily. Also, you will notice that the windage screw head at the rear is not positioned parallel to the sight. It can be considered a design flaw but it does not actually hamper the sight’s overall performance. Still, anyone can safely say that this is a solid product, which is less prone to wiggling. It also comes with nice adjustments on the rear sights. It boasts of its excellent audible clicks while promoting ease of adjustment. It also boasts of its solid mount to the rail. Even if it’s made to be solid and tough, you will still enjoy the fact that it is totally lightweight as it offers a guarantee that you can easily manage and handle it. Aside from the mentioned factors, it’s also advisable to gather information about the different types of iron sights. You can actually categorize the iron sights based on their aperture. There is what we call as the aperture sight or peephole sight, which refers to the hole that you’re looking through using the rear sight. It’s advisable to line up in the hole’s front sight post to guarantee the proper aim. The majority of iron sights actually come with two various sizes for their aperture. The bigger one is ideal in case you’re dealing with short-range situations. This promotes ease when planning to acquire your target quickly. The smaller aperture, on the other hand, is perfect in case of long-range shots where you need to have the perfect accuracy. Another option you have is the post-and-notch sight guaranteed to offer a wider field of view. Lastly, there is the 45-degree or offset iron sight. It’s an excellent choice just in case you want to transition quickly from short and long-range targets. To use this, you just have to tilt your rifle slightly then look down at it normally. It’s perfect in case you’re in a situation that requires you to switch target distance quickly, like in combat or 3-gun shooting competition. Now that you’ve gathered some relevant details about the top iron sights in the market today, it’s time to understand how you can actually make the best choice. Note that you can’t expect all metal sights to fit the AR15 rifle system. That said, it’s crucial to look for an iron sight, which is compatible with your AR15. Such offers an assurance that you can mount it on the appropriate gun rails. In this case, learn about the actual manufacturer of your AR15 gun rail so you can easily find an iron sight, which perfectly suits it. Another vital factor to consider is the overall setup of your AR15. 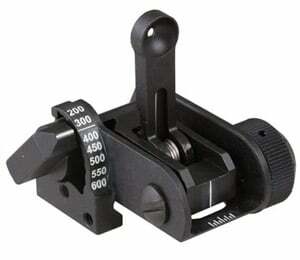 You need to consider the setup because it will help you figure out whether you need a fixed or a folding iron sight. The fixed iron sight is beneficial in the sense that it does not come with any moving parts; hence, making them almost indestructible. You can also expect it to be always ready. You just have to set it up then let it do its job. The folding sight, on the other hand, performs another function. It’s an ideal option in case you want it flip it down to ensure that it’s out of the way when unused. If possible, choose the fixed iron sight if what you’re looking for is the one, which you can use as your AR’s primary targeting system. However, if you’re planning to use one as a backup then it’s advisable to go for the folding sight. Another important consideration is whether or not the iron sight is easy to use. Avoid those that require a lot of effort to mount. Also, avoid complex ones that still require you to use a screwdriver or wrench in case of adjusting elevation. Note that the best iron sight is that which allows you to locate your target quickly. It is also easy to adjust. Make sure that you look for an iron sight, which is easy to adjust. It should have a capability integrated into it, which makes it possible for you to adjust its elevation and windage. Such promotes ease when using this product. You also need to look for an iron sight, which you can quickly deploy. Such is crucial especially if you’re in a tactical situation and you’re dealing with a scope failure. You can’t expect to recover fast if you can’t quickly switch over to your iron sight. You know that you’re getting the best AR15 iron sight if you can quickly put it to action once needed. Ensure that you can easily and quickly flip it into position with just one press of a button. If possible, it should come with angle sights, too, that can be activated in case you turn your gun at a slight angle. Check out the material used in the iron sight, too. The material should be sturdy enough and withstand tough use. Among the common materials used in this product are actually aluminum, steel, and polymer. Note that while steel has the highest level of durability, allowing it to serve its purpose for the long term, aluminum is also a tough material, which is more lightweight. Lightweight materials are easier to manage, making iron sights made of aluminum great options, too. To aim using your iron sight, it’s crucial for you to have a front sight. It could be a post or block, forming the shape of an “I”. It’s also necessary to have a notched rear site, forming the shape of a “U”. Put the front sight in the middle of the rear sight. Ensure that the topmost part of the rear and front sights line up perfectly. It’s also necessary for the front sight to have a similar amount of space in both the right and left of the rear sight. Start to aim by focusing on the front sight. Observe the alignment with the rear, which should be a bit blurred. The front, on the other hand, needs to be really clear. Aim at it while letting all the others vanish. Avoid looking at your target. Your goal should be to focus on the front sight as well as how aligned it is with the rear sight. You might need to glance at the target from time to time, though as a means of getting the perfect alignment for the sight. However, once you got the alignment, you have to bring back your focus to the front sight. 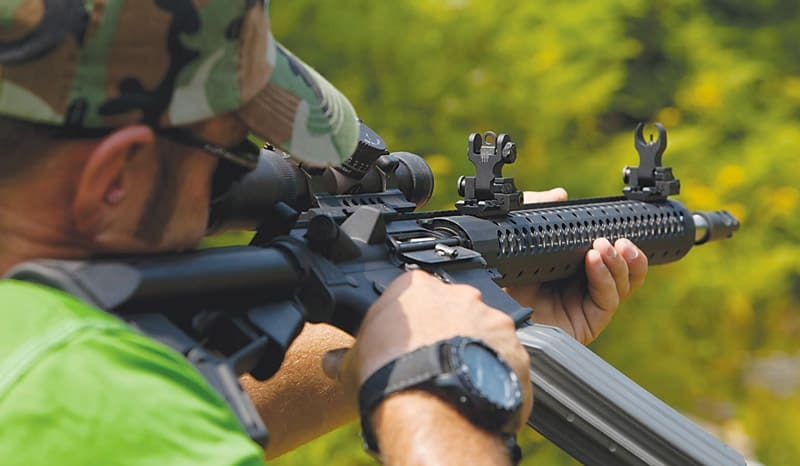 When it comes to performance, overall quality, built, features, and flexibility, the clear winner out of the 6 reviews AR15 iron sights is the TACTICON 45-degree Offset Flip-up Iron Sight. Constructed out of genuine metal, you have a guarantee that this iron sight won’t let you down as far as sturdiness is concerned. Also, it is reasonably priced plus it continues to receive good reviews from its users, making it really one of the best AR15 iron sights you can find.